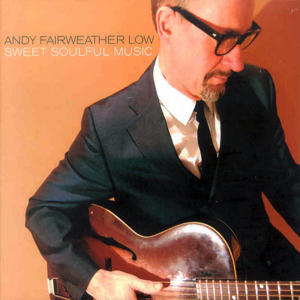 When Andy Fairweather Low released ‘Sweet Soulful Music’ on Monday 14th August 2006 it was his first solo album in 26 years. Yet this is no simple ‘comeback’ story - those intervening years have been packed with people and projects virtually amounting to a stellar A to Z of Popular Music. He has a magnificent CV. Throughout his momentous career, Fairweather Low has played with such artists as Bob Dylan, Roger Waters, Eric Clapton, George Harrison, Elton John, Jimi Hendrix, David Crosby, The Band, Richard and Linda Thompson, Dave Gilmour, The Who, BB King, Joe Cocker, Steve Winwood, Donald ‘Duck’ Dunn, Jimmy Page, Ronnie Lane, Linda Ronstadt, Roddy Frame, Emmylou Harris, Joe Satriani, the Bee Gees, Jeff Beck, The Impressions, Lonnie Donegan, Ringo Starr, Steve Gadd, David Sanborn, Benmont Tench, Warren Zevon, Charlie Watts, Mary J. Blige, Dave Edmunds, Georgie Fame, Bonnie Raitt, Otis Rush, Phil Collins, Van Morrison, Gerry Rafferty, Chris Rea, Buddy Guy, Chris Barber, Jackson Browne, Bill Wyman, Sheryl Crow, Clarence ‘Gatemouth’ Brown, Pete Townshend and hundreds more. Quite simply, Andy Fairweather Low has been – and continues to be - the guitarist and vocalist of choice for a phenomenal cast list of musical luminaries. Cardiff-born Fairweather Low originally came to fame as vocalist and leader of the pop group Amen Corner. The band had four Top 30 hits – a sequence starting with ‘Gin House Blues’ in 1967 - on Decca’s subsidiary Deram label before leaving at the end of 1968 to join Andrew Loog Oldham’s pioneering indie, Immediate. Amen Corner were instantly rewarded with a UK number one, ‘(If Paradise Is) Half As Nice’ in early 1969 but, despite another Top Five hit with Roy Wood’s ‘Hello Susie’, it seemed the band could not survive success. By the following year Amen Corner had split, with Andy Fairweather Low escaping the teenybop grind by forming the simply named Fairweather, a band signed to RCA’s shiny new progressive label, Neon. Fairweather reached number six in the UK singles chart with ‘Natural Sinner’ during the summer of 1970. It was to be, however, the band’s only hit. One album later and Fairweather came to an end. Andy Fairweather Low then became somewhat of a refugee from the music business, eventually emerging three years later as a solo artist with an album called ‘Spider Jiving’ on A&M. The album was produced by Elliot Mazer – best known for his work with Neil Young – and featured some heavyweight backup support from the likes of the Memphis Horns and Nashville legend Charlie McCoy on harmonica. ‘Spider Jiving’ included the wah-wah driven ‘Reggae Tune’, a UK Top 10 hit in September 1974. Andy Fairweather Low was on something of a roll. The following year, 1975, he released his second solo album, ‘La Booga Rooga’, which eventually emerged as his most successful record. Produced by the celebrated Glyn Johns – at that time fresh from working with The Eagles – ‘La Booga Rooga’ featured such stellar musicians as ex-Eagle Bernie Leadon (guitar), Dave Mattacks (drums), Eddie ‘Tan Tan’ Thornton (trumpet), Kenney Jones (drums), John ‘Rabbit’ Bundrick (keyboards), BJ Cole (steel guitar) and Georgie Fame (keyboards). Among the tracks was ‘Wide Eyed and Legless’, a Top 10 hit for Fairweather Low at the end of 1975. Johns was also at the helm for ‘Be Bop ‘n’ Holla’, Fairweather Low’s 1976 album. It was followed, in 1980, by ‘Mega-Shebang’, recorded for Warner Brothers and destined to be Fairweather Low’s final solo album until 2006. In between ‘Be Bop ‘n’ Holla’ and ‘Mega-Shebang’, however, Fairweather Low sang backing vocals on The Who’s 1978 ‘Who Are You’ album - the start of a relationship which also saw him playing guitar on the band’s 1982 album, ‘It’s Hard’, and appearing with Pete Townshend on his 1993 ‘Psychoderelict’ tour. That work with The Who set the direction for Fairweather Low’s next moves. He became the ultimate Guitarist to the Stars, building an extraordinary reputation that has endured to this day. Most notably, Fairweather Low has been a stalwart of Eric Clapton’s band since the early-Nineties, touring in Clapton’s bands right up until 2003 and recording the ‘Unplugged’, ‘From the Cradle’, ‘Pilgrim’, ‘Riding with the King’, ‘Reptile’, ‘One More Car One More Rider’, ‘Me & Mr. Johnson’ and ‘Back Home’ albums with him. Andy was asked to be part of Eric Clapton’s UK tour in May 2009 and was happy to do so. Fairweather Low was also a regular player with George Harrison, appearing on his ‘Live in Japan’ album and, in 2002, playing several of the lead guitar parts for the Harrison tribute, ‘The Concert for George’. One of Fairweather Low’s longest musical relationships, however, has been with Roger Waters. The two have worked together since Waters’ ‘Pros and Cons of Hitchhiking’ tour of America in 1985. Since that time Fairweather Low has contributed to two of Waters’ albums – ‘Radio K.A.O.S’ in 1987 and ‘Amused to Death’ in 1992 – and played guitar and bass on the 1999-2002 ‘In the Flesh’ world tour. Fairweather Low rejoined Waters for the ‘Dark Side of the Moon’ tour this year. Fairweather Low was also a regular member of Bill Wyman’s Rhythm Kings, the consequence of another relationship that stretches back to the mid-Eighties. Fairweather Low and Wyman first worked together at the Small Faces’ legendary bass player Ronnie Lane’s A.R.M.S. – Action for Research into Multiple Sclerosis – benefit concert at London’s Royal Albert Hall in 1983. It was a charity cause that Wyman revisited in 1985 with Willie & The Poor Boys, a Fifties’ style rock ‘n’ roll concept band featuring Fairweather Low. Since that time Fairweather Low has been frequently involved in Wyman’s projects, most recently touring with the Rhythm Kings in 2005 and the summer of 2006. But perhaps it was inevitable that one day Fairweather Low would be tempted to return to the studio in his own right. That time has come. ‘Sweet Soulful Music’ reunites Fairweather Low with producer Glyn Johns - and features bassist David Bronze (Eric Clapton, Robin Trower, Procol Harum), drummer Henry Spinetti (Eric Clapton, George Harrison, Paul McCartney, Roger Daltrey) and John ‘Rabbit’ Bundrick (Bob Marley, The Who, Pete Townshend) together with Roger Waters’ back-up singers Katie Kissoon, Carol Kenyon and PP Arnold. Twenty-six years was a long wait but ‘Sweet Soulful Music’ signaled a welcome return to Solo work for one of the UK’s most distinctive artists, as heartily endorsed by many of the world’s greatest talents. October 2007 saw Andy touring solo again in the UK with his own all star band containing Chris Stainton – Keyboards, Dave Bronze – Bass and Paul Beavis – Drums. 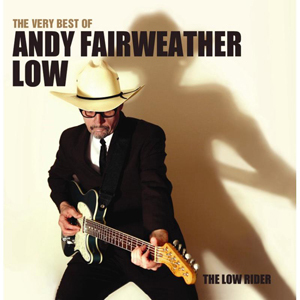 One of the shows was filmed and the resulting DVD is released in June 2008 closely following the TV advertised release of his new album – The Very Best Of Andy Fairweather Low – The Low Rider. Further tours in 2008 & 2009 cemented Andy’s position in the UK as a live touring band and he won many new friends whilst opening shows with the band for Robert Cray, Dennis Locorriere & latterly Eric Clapton on their UK tours. The permanent line up of his band The Low Riders is Paul Beavis – Drums, Dave Bronze – Bass & Vocals & Nick Pentelow - Sax and Clarinet. Andy & The Lowriders opened the shows on the 2011 UK Eric Clapton UK Tour and a live CD called 'Lively' was released later that year. 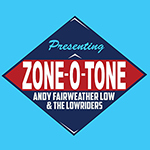 They have been in the studio again and 'Zone O Tone' their new CD is released this Summer on Proper Records. 2013 sees Andy & The band opening the shows on Eric’s European tour and they will be touring the UK in support of Zone-O-Tone this Autumn.